I had the pleasure of talking to former University of Illinois and current Chicago Slaughter QB Isiah “Juice” Williams. 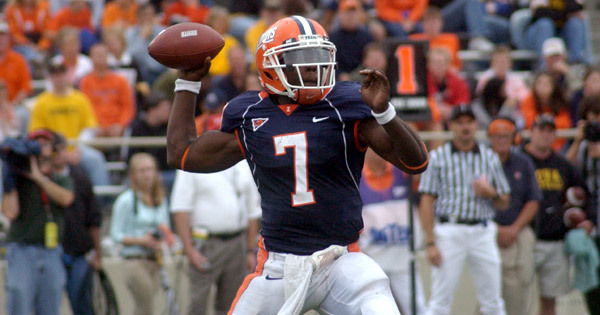 Juice Williams was the quarterback at Illinois for four seasons. Now he is the QB of the Chicago Slaughter, which is an arena football team, part of the Indoor Football League. I asked Juice a few questions about his time at Illinois and his current state with the Slaughter. Pat: Going into the 2007 college football season, what were the expectations of you and your Illini teammates and coaches? Juice: Overall, we wanted to just improve on the previous year’s records. In 2006, we finished 2-10 but there were 6 games in which we lost in the 4th quarter. Improving the team by molding current talent and signing elite talent was the main idea. We’d figure we would win a few of those close games now and become bowl eligible. No way did we actually think we’d be in the Rose Bowl that season. Pat: At what point during the 2007 season did you and your team realize that you had something special happening? Juice: After we beat #13 Penn State at home, guys began to open their eyes and started to jump on the team bandwagon. After we beat #5 Wisconsin the following week, the entire roster was sold and truly believed we were a special team and we could play with anyone in the country. Pat: Besides the Ohio State game, which game did you feel was the most important to the great success that season? Juice: After we lost two straight games to Iowa and Michigan, the team’s momentum began to fade away. It was tough for us to execute our game plans because we didn’t the “wheels rolling”. But we bounced back against Ball State in a hard fought homecoming game. In my eyes, the win over Ball State propelled the team into a special group. That win sparked a blowout win against Minnesota the following week. Pat: How confident were you going into the Ohio State game, and what was the general feeling afterwards? Pat: What does it mean to you to be the all time offensive leader in Illinois football history? Juice: Being the all time offensive leader is awesome, honestly. Many great players have played for the Fighting Illini over the years and I was able to surpass all those guys in total yardage, that’s a huge milestone for me. Pat: Only 4 other players in the history of the Big Ten Conference recorded more total yards then you did while playing for the Illini. What does it mean to you to be up there with so many other great players that have played in this conference? Pat: What do you feel was your greatest accomplishment while playing for the Illini? Juice: Besides all the upset wins over ranked opponents and leading the team to the Rose Bowl Game, I would say leading the Big Ten in Passing yds, Pass TDS, Pass Efficiency, Completions, and TD passes over 60 yds as a Junior was the greatest. As a freshman, I was dead last in all those categories but I was able to bounce back and become a polished passer with the help of my team and coaches. Pat: You now play football for the Indoor Football League team, Chicago Slaughter. What is the been the biggest transition from the type of football you have played all of your life, to the Arena game? Juice: The biggest transition from outdoor football to arena football is the size of the field. Because the field is smaller, the game speed is much faster and reads have to be made much sooner. Those walls are dangerous as well. I was flipped over a wall last season and it wasn’t the greatest feeling. However, it’s a great league and I really enjoyed playing for the Chicago Slaughter. We want to thank Juice Williams very much for taking the time to let us interview him. Be sure to check out some Chicago Slaughter games!